"Weird Al" Yankovic's promotional blitz for Mandatory Fun is starting to feel like a relentless onslaught, but we're not complaining. With the quality of videos that keep pouring out, we look forward to each new day. Up next, a clip for "The Sports Song." 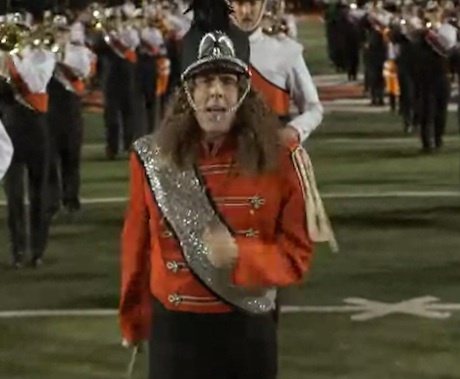 The track — a regal, sports-themed march about how Al's sports team is better than yours — is treated to a suitable video that sees the singer march down a football field with a giant marching band. There aren't a ton of jokes, but it's a lot of fun. Need more Weird Al? Really? You're an addict! Fortunately, the artist also stopped by Conan last night (July 17), where he performed the Pharrell parody "Tacky."